My fascination with religion is well documented in this blog. Not growing up with any kind of formal religion, Easter was just another holiday with candy and magic beings sneaking into your home, concluding with a ham. It wasn’t until later that I found out that other popular part of Easter. Friends did the whole Easter Sunday thing. I hopped (heh) around to a couple different churches for Easter. I think my favorite was a friend’s “New Wave” Catholic church that was in an old movie theater. They had fancy lights and songs with a small band. We’re talking legit production value. They set up the scene: Jesus. Betrayed. Left to die on the cross and then shoved into a cave when- OH NO! TUNE IN NEXT TIME KIDS. The mass was a two parter. I missed the second day. But this mass is when I came to really understand the story of Easter. I knew the basics, but was pretty vague on the details. I remember at a couple points during mass turning to my friend and saying, “Really?” Trying to straddle that line of not being disrespectful, but to an outsider… Catholicism is really, really brutal. Even with 90s rock music undertones. 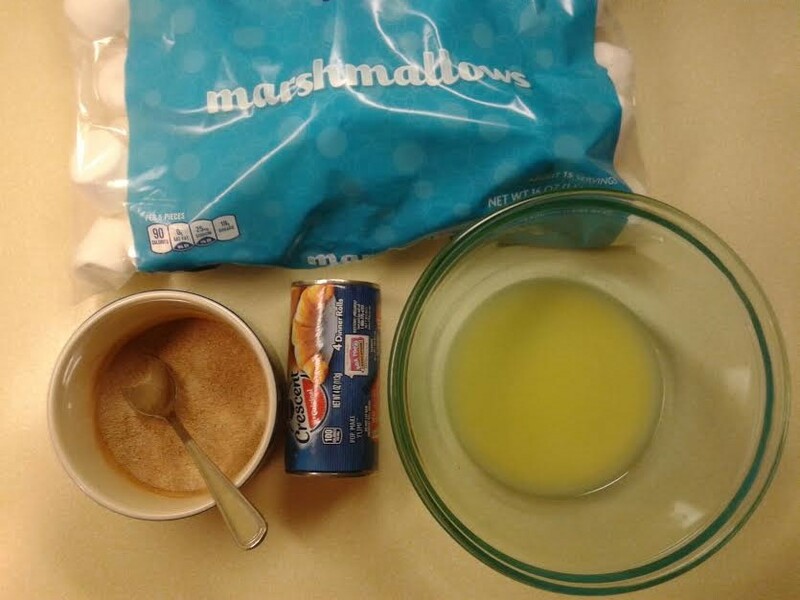 The marshmallow is dipped in butter, rolled in cinnamon sugar, and wrapped in dough. 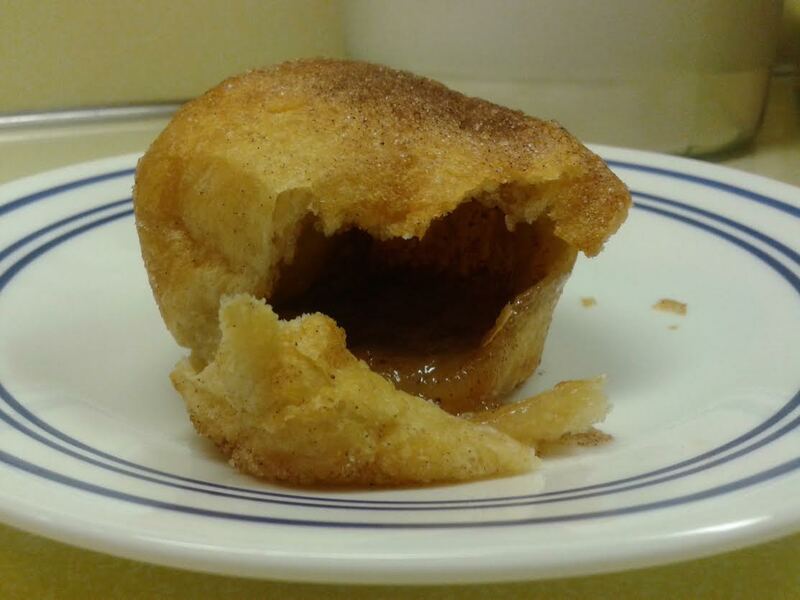 Top with more cinnamon sugar and bake. The heat of the oven melts the marshmallow, which is then absorbed by the dough. When they come out they are empty because THE MARSHMALLOW IS CHRIST AND NOW THE TOMB IS EMPTY HAPPY EASTER EVERYONE. If I had been given treats and taught bible stories when I was a kid, would I have taken to a Christian faith? It’s possible! Catholics do have the juice and crackers going on too. Hrm. And for the record, Christ’s Tomb was delicious. Shall I compare thee to a pound cake? That’s right, I am NOT a food blogger! I enjoy food and like to cook and bake on occasion, but lets face it. My stuff is not going to come out looking like a spread in some magazine. I take the pictures in my underlit 1950s home with my cell phone camera. It is what it is. But since I enjoy food, I’ll talk about it here. I just ask you to remember I’m not a food blogger. Okay, enough preamble. Thanksgiving was a great success, but like anyone, I’m dealing with the aftermath of leftovers. In years past I’ve gotten creative and made turkey nachos, turkey pot pies, turkey sandwiches… the meat is always the easy part. But this year I had leftover cranberry orange sauce (see the last post). 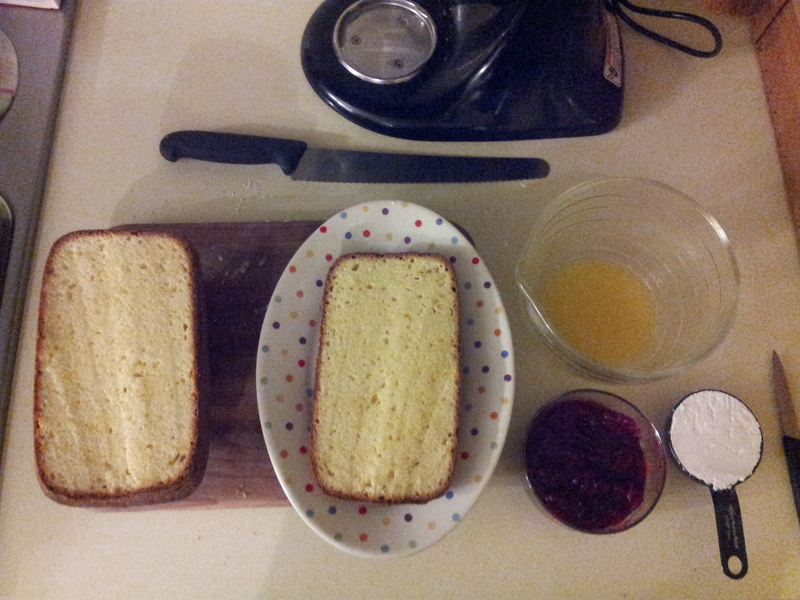 And in my desperate attempt to figure out what to do with it, I stumbled across this cranberry orange cake. If you follow the link, it is GORGEOUS. Roxana makes the cake from scratch and there is some Martha Stewart realness happening. I just bought a box of pound cake mix and tried to replicate the cake best I could. 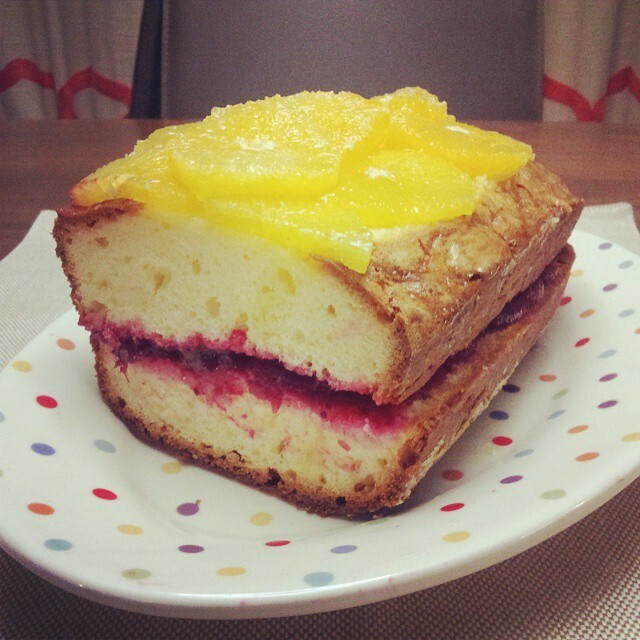 For I am not Martha Stewart – I am but a humble lady who likes cake. My cranberry sauce is similar to her filling, so I just cut the finished pound cake in half and spread that in the middle. Then I sliced up some oranges and mixed a half cup of powdered sugar with a few tablespoons of orange juice to make a glaze. Ta daaa. It’s not movie star cake. But it IS delicious. I feel like this cake is a lot like me. For what it may lack in refinement – who cares. It’s still cake! A great vehicle to use up leftover cranberry sauce and you’d never know it was leftovers. I give this cake about three days in this house. Bon Appé-eat! When stuck with an overripe banana. 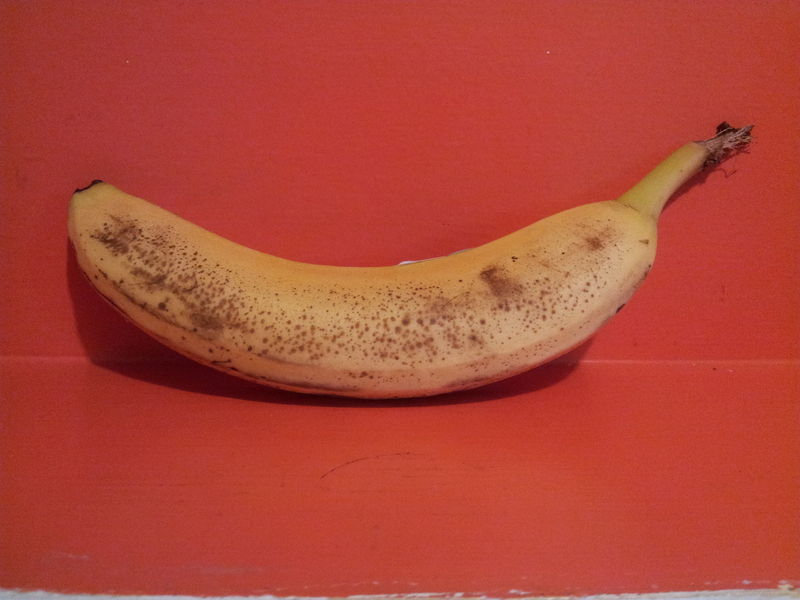 Here is our single banana. Without fail. Today’s post is short because I haven’t been feeling well, truth be told. BUT DO YOU EVER HAVE LIKE ONE BANANA YOU DIDN’T GET TO? And you’re all, “Awww man.” and it’s all spotty and the texture is too soft to be manageable or palatable in anyway, like if you could trap weird sadness inside a sandwich baggie and leave it in the sun. I’m feeling gross just talking about it. But this happens to me ALL the time. The hubs and I typically eat a banana a day. I have weird health things so they’re one of the only fruits I can eat anymore. A balanced breakfast is a. a banana b. a yogurt from Trader Joe’s c. fistful of supplements and c. a single cup of coffee. Then I’m on my way. Two ways to make do with that overripe banana (that avoid throwing it away). Pinterest revealed to me this one banana banana bread recipe (say that five times fast) and I loved it. I’m a great instruction follower when it comes to baking, but my attempts at just tweaking banana bread recipes by half or a third so the one banana would be proportionate to the bread? Misery. Either I succeeded in baking a rock or a never solidifying lump of goo. At least someone better equipped for these matters was able to make the dream happen. I was thinking about including a picture… but why? It’s banana bread, you know what it looks like. Tada. If you click the link and you will see a stumpy loaf (which I solved by baking in a smaller loaf pan). Now these, THESE are great. Take banana bread. But make it slightly firmer and not as crumbly. And cookie shaped. Yes. Important to mention. That’s what these are! Now this recipe calls for a 1/4 cup banana mush, banana chips, as well as nuts. I had to neuter the recipe due to nut allergies (HEH) but I’ve never seen or heard about no kinda banana chips. So I used a whole banana and cinnamon chips. When in doubt, my friends, ADD CINNAMON CHIPS. We add them to a lot of our baked goods. There’s a storage can of them sitting on my counter so they can be available at a MOMENTS NOTICE. THAT’S HOW IMPORTANT THIS IS. No photos of these because they were all eaten. But there you have it! I have solved yet another one of life’s little mysteries. Maybe next I’ll tackle why my back hurts when I sit and my limbs get tingly. STAY TUNED. I read a lot of cooking and baking blogs. They serve me better than any cookbook I could ever own. I’m often left with that one odd ingredient that’s needs to be used or need something ‘gluten-free’ quickly, etc. etc. The ability to search blogs has just revolutionized my cooking. It’s awesome. Praise be to the all mighty google reader. The other part I love about these blogs is the narrative. The link above is to a blog post where Tracey heads out to the orchard to pick apples and then makes delicious muffins with them. The whole post is so wonderfully fall. Fall is about three weeks long here in Houston, so I kind of go ‘all out’ with my fall-ness. When you live up north, especially Washington state, going to the orchard is something you just DO. Field trips to Greenbluff were common when I was a kid. Needless to say, I’m making muffins at some point this weekend.